My wife Susan and I made the decision almost twenty years ago to buy a boat and go cruising while we were still young and healthy enough to enjoy the lifestyle. Watching friends plan and work for years, then have their dreams smashed on the rocks due to health or family issues was a driving factor in this decision. The one major stumbling block in our plan was the financial aspects. We are neither wealthy, retired with a pension, or on the list of a family member to inherit a lot of cash. So how in the world would we accomplish this with no income once the dock lines were untied and we left our home waters? Those are tough and scary decisions but they needed to be overcome if our plan would work. The solution would be to buy the boat with the sale of our property and business, outfit it for extended cruising, put enough money in the bank to carry us through our cruise, and then get us to a place where we could settle in and find jobs to build the cruising kitty so we could start again. For the plan to work, we also needed to keep our expenses to a minimum without making our cruising lifestyle a bit more than a survival existence. It was important to us that we enjoy the ride and have a great time or it did not make sense to do this at all. 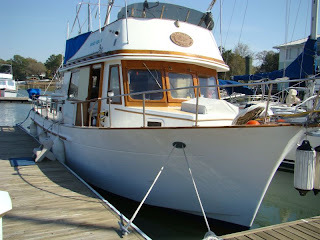 After 17 years aboard our Mariner 40 ketch, Sea Trek, and with tens of thousands of miles under the keel, we are now switching gears and have recently purchased a Marine Trader 34 trawler so that we might enjoy some new cruising grounds that are just not practical on a deep draft sailboat. Once again, it is hard for us to believe that after 28 years and an unknown numbers of owners this boat has never had an anchor windlass. We have to think that it did not get much anchoring done over its lifetime but someone somehow managed to bend the shank on the 35 pound CQR that came with the boat. 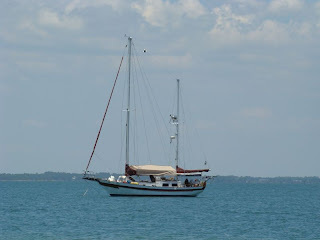 Our cruising style is more anchoring and less marina stays so getting the anchoring system right is very important and with a new storm season less than a month away we felt is was past time to get it done and get it right. An anchor windlass is an important part us our system. Once the anchoring and bow platforms were refurbished, see our post here, the next step was to find a windlass that would fit in the space behind the anchor roller and in front of the Sampson post. 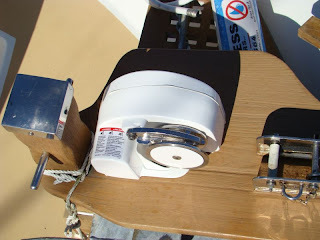 This is not a large area so a windlass small enough to fit but powerful enough to handle the anchor and rode did not leave us with a lot of choices. Additional weight at the bow is another concern for us. The one we finally decided on that would fit our needs is the Powerwinch. We usually take any manufacturers specs with a grain of salt and any time they are marginal based on their numbers, we go with the next larger size. 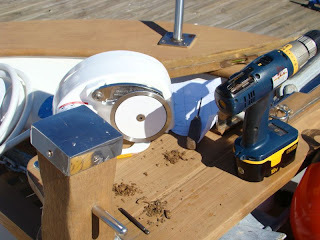 We sized the windlass, rode, and anchor for a 40 boat. This meant the Class 41 windlass from the Powerwinch line. It fit our space, did not add a lot of additional weight on the bow and seemed to be more than powerful enough for Beach House. 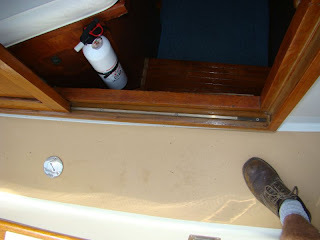 The one down side was it does not have the capabilities to manually raise the anchor if power or the windlass quits, but we can live with that since the large anchors and all chain rode we used on our sailboat are a thing of the past. The repair of the side entrance door has finally come to the top of the to-do list. It has been something that has needed to be done since we bought the boat and every time we come and go it reminds us that we need to get it done. I can't take credit for the idea, it was suggested to me by another member of the Marine Trawler Owners Association. 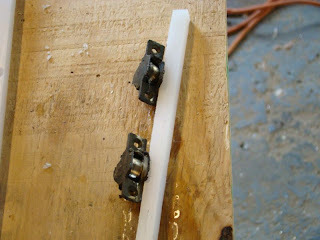 I had ask the members for a source to find the rollers on the bottom of the doors that had worn out some time ago. This made sliding the door difficult and it was noisy when it rattled around when opening and closing it, plus the latches to lock the door open and shut would not line up and was a pain to lock. Another MTOA member suggested that the track and rollers be replaced with UHMW plastic instead of trying to replace or rebuild the rollers. This type of plastic is very durable, easy to cut to shape and most importantly will slide very easily against itself with very little friction. We found the plastic here, and ordered it on line. The product was very inexpensive and arrived only a few days after we ordered it.